Photo by Marty Cheek – From left, Crystal Patino, registered dental assistant; Dr. Kinberly Antrim (with large toothbrush); Leslie Bozzo, registered dental hygienist; and Sylvia Medina, registered dental assistant, pose in their Gilroy dental office. 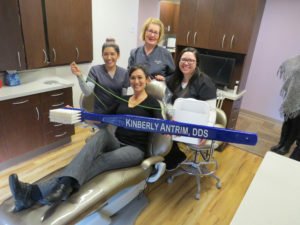 Kinberly Antrim knows people feel squeamish about laying in a dental chair and anticipating the invasion of a needle or drill. To help alleviate the anxiety, the Gilroy dentist created a cozy office in a Wren Avenue medical center where patients getting their teeth examined or cleaned enjoy tunes on headsets or a film on TV while relaxing in a massage chair. 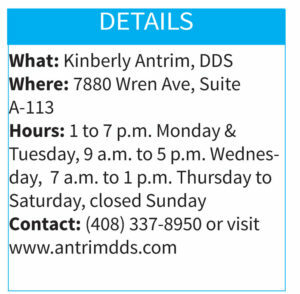 For Antrim and her staff, clear communication is the most important tool to help their customers deal with a fear of pain or discomfort during a dental procedure. The dentist has lived in Gilroy since her family moved here when she was 2 years old. Many factors played a part in her decision when she was 18 years old to go into a career working on people’s teeth and gums. She thought it was something she would love doing with her life. After she graduated from Gilroy High School in 2000, she went to San Jose State and earned a degree in biology. She then went to the University California, Los Angeles to attend dental school and build her skills. She did a residency in Albuquerque, New Mexico, where she helped low-income residents improve their dental health. She moved back to Gilroy and worked for a period of time at a local dentist office. In October 2016, she opened her own dental practice where she does general exams and treatments on patients. Antrim enjoys working with her staff who work closely with patients to make sure their experience with a check-up or cleaning is as pain-free as possible. Her patients range from toddlers to a centenarian. She recommends to her patients that for the health of their teeth, they eat a good diet, brush and floss every day and see the dentist for a regular checkup to catch dental problems early before they get out of hand. Ivan Silveira Aguilarte is a reporter for Gilroy Life.